Gabriele Heller is a superb vocalist and actor who uses her skills to draw every drop of emotion from a song. She can turn her talents to a wide range of styles and material, from the earliest blues to contemporary electronica and free improvisation. Her performances usually include some of her own songs. 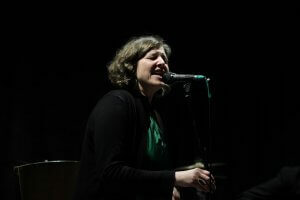 Tonight at the Globe she is working with two musicians who helped launch her vocal career in the North East, Steve Glendinning (guitar) and Dave Parker (bass). The repertoire will be mostly mainstream jazz but in her hands even familiar songs sound new.